All profits donated to charity. 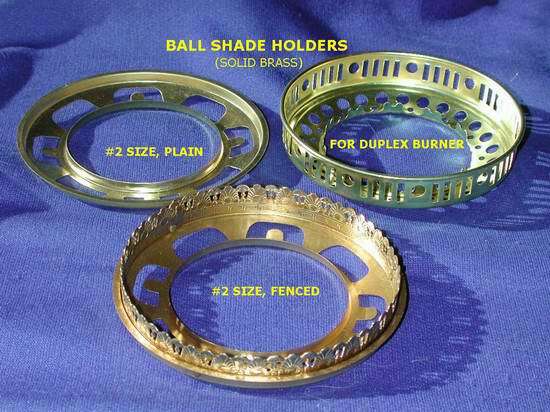 OIL/KEROSENE SHADE HOLDERS - These are metal fittings that support a glass shade or globe resting on the burner. The tripod types that I keep in stock is made for a 7-inch & 10-inch diameter shade. There is no extra charge to place a special order. Be sure to select the correct tripod for your particular burner: the older burners have a slightly smaller rim diameter than the new ones. 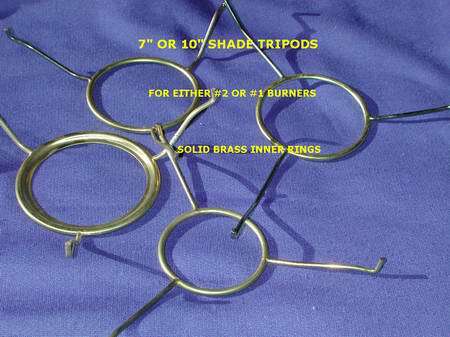 A tripod is a small brass hoop with three radiating arms that support the shade at their ends. Tripods work well for light-weight shades. Although more expensive, shade rings are much stronger and sturdier. A shade ring is like a wheel, with the shade resting on the outer rim. The ball shade holder, which looks like a holey frisby, supports a glass shade whose fitter has a 4-inch diameter. Click on the small photographs to enlarge If you have questions or need advice, please EMAIL FOR ASSISTANCE"
10" Tripod, for Center Draft 4-prong burners (Miller, Royal,B&H) burner.